The 50’s ushered in a period of major change. 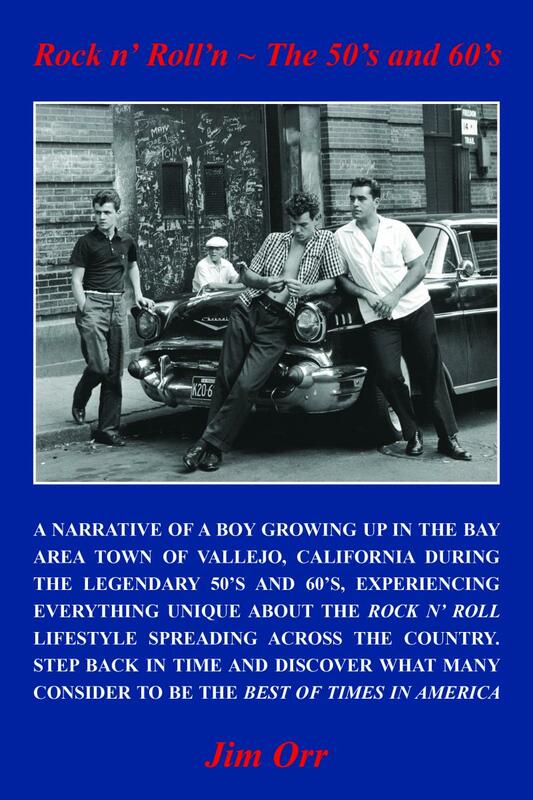 Crime was low, children played freely outside, Elvis was Rock n’ Roll’n, a home cost $14,500, a car about $2000. Teenagers were discovering the Rock n’ Roll lifestylc spreading across the country including Motown and Rock n’ Roll music, Teen dances, Going “Steady” with your girlfriend or boyfriend, Cruisn’ on Friday and Saturday nights, Hang’n at the Drive-In-Restaurant, American Bandstand Mania on TV, Classic car clubs, Drag racing with the boys, Twenty cent gasoline…….....................................and more! This is a story about a boy and his friends growng up during those exciting times. It begins in the winter of 1944 as the boys parents give up everything in upstate New York and head to California for their piece of the American Dream﻿. It was a hot Friday night that summer in 1959 as a bunch of us guys met up at Eat n' Run Drive-In Restaurant to hang out. After a while, my friend Ron and another guy drove up in Ron’s cool 51’ Mercury. “Hey Jim, I hear there’s a party someplace up on Tuolumne Street. Want to check it out?” “Sure” I responded. So I jumped in the back seat as Ron introduced me to his older cousin Arnie who had just moved into town. We then burned rubber down the road; first gear, second gear, third gear, the mufflers blowing out a cool rumbling sound that echoed off the sides of the buildings we passed. As we drove along, I noticed something weird about Ron’s cousin Arnie. He never spoke a word, having this glassy eyed “tough guy” angry look painted on his face. He continued to remain cold and aloof as Ron and I jawed back and forth with each other. Little did we know the “Big Time” trouble Arnie was going to cause that evening….waiting just around the corner!